Earlier this week, the Ministry of Development held the fifth İzmir Economic Congress. The first one was organized in February 1923 when negotiations for the Treaty of Lausanne were suspended because of important disagreements regarding, in particular, the future of Ottoman public debt and free trade agreements with European countries. The main motivation for such a congress was not, as is regularly claimed by the official historic discourse, just the determination of the economic principles of the future Republic of Turkey, but also to send a message to the West that the new republic would be faithful to the open market economy, respecting property rights and existing agreements. Six years later, starting in June 1929, this pro-market framework would be abandoned and a command economy would be established step by step. This was a long time ago. Currently, Turkey is facing other challenges on the economic front. Growth has not only slowed, causing an increase in unemployment, but at the same time the contribution of productivity to growth has disappeared, threatening to make Turkey a prisoner of the middle-income trap. 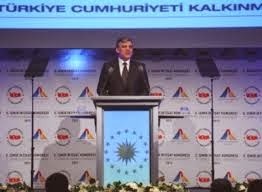 Given this fact, among the official speakers during the opening ceremony of the İzmir congress, only the president of the republic, Mr. Abdullah Gül, focused clearly and openly on the economic challenges that Turkey is facing. Indeed, in mentioning the speech by Prime Minister Recep Tayyip Erdoğan, I must say it carried mostly political messages rather than discussing the economic challenges. Mr. Erdoğan reiterated once again the 2023 more-than-ambitious-targets, such as $25,000 per capita income. President Gül did not mention these targets at all but, recognizing the threat of the middle-income trap, listed the “second generation reforms” that Turkey needs in order to escape from this trap. According to President Gül, the key factor is human capital. Turkey needs an education system reform focused on the quality of education. During the panel session on “Inclusive development policies” which I followed, Will Wiseman from the World Bank showed how Turkey is lagging behind its competitors with respect to the quality of education, despite the improvements observed in the Organization for Economic Cooperation and Development's (OECD) Program for International Student Assessment (PISA) records in recent years. Other academics drew attention to the gap existing in Turkey, particularly in preschool education. Research for years has clearly established that the rate of return of investments in this area is the highest compared to other educational investments. Moreover, the increase of preschool services has an important impact on the number of working women -- another challenge which Turkey is facing giving the low female labor force participation rate, which was one of the popular topics during the congress. President Gül noted that the countries that have been successful in escaping the middle-income trap are spending 6 percent of their gross domestic product (GDP) on education. The Justice and Development Party (AK Party) rule succeeded in increasing this ratio from 3 percent to 4.5 percent, as noted by Mr. Gül, but obviously more is needed. However, spending more money on education might be necessary, but that is insufficient in improving the quality of Turkish human capital in the future. The educational system must become more competitive and the quality of teachers must be rapidly increased. This requires certainly more financial resources but also a mentality revolution in the secondary education system that must become more open to universal values and to creativity as well as to open minds. As for universities, they need not only more academic autonomy but also financial autonomy in particular, which would free them from their bureaucratic fetters. Rapidly increasing the average duration of schooling, which hardly reaches eight years here while South Korea is now at 12 years, and improving the quality of education at all levels are not sufficient to have high and sustainable economic growth. There must also be a demand for this qualified labor. Thus, as pointed out by President Gül, Turkey needs at the same time to spend more on technology, innovation and R&D and to spend this money in an efficient manner. So far, so good! But what about concrete policy suggestions? Mr. Gül has been quite disappointing in this area. He contented himself with referring to the 10th five-year plan recently published. However, I do not think that the reform spirit of the plan is courageous or radical enough to deal with the actual challenges.